Our Retail Flags are perfect to take your message wherever you wish. Be it the parking lots, store windows, food courts, street poles or roof tops, our flags make sure that your message is well noticed. 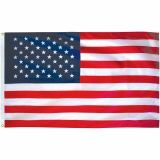 Choose from a wide variety of retail flags including attention getting flags like tall flags or checkered flags, brand promotion flags, message flags, streamers and pennants, we have everything you ask for and more!Shop from our complete line of Retail Flags right away and get the best prices, quick shipping, and much more! 100% customer satisfaction guaranteed! Our Retail Flags are the best way to grab the attention of all the people around. 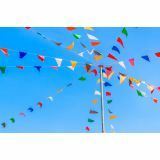 Cost effective and attention grabbing, our business flags are available in countless delightful models including the towering tall flags to the festive pennants, wave banners, and sidewalk signs among others. Our vibrant colors, attractive shapes, and the free rotation features will all draw potential customers' attention to your store. You can even convey your business messages like “big sale” or “special offers” on our Retail Flags. Our message banners have grommets to attach to the poles securely without damaging the flag material. Retail flags are perfect advertising fixtures to welcome customers into your business off of the street. 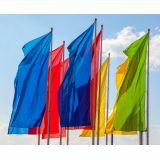 Ideal for exterior use, our retail flags perfectly complement your company, as passersby feel welcomed and well informed about your store promotional activities. 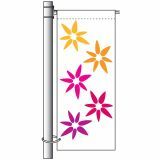 Grab easy attention of everyone around with these impressive and beautiful retail flags that can be personalized in any way that you wish. 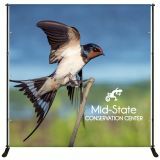 Check out our collection of Retail Flags and choose a model that matches your needs. Find it overwhelming? Just call us at our toll free number (888) 287-3524 or email us at customercare@tuffflags.com and we shall walk you through the selection process.